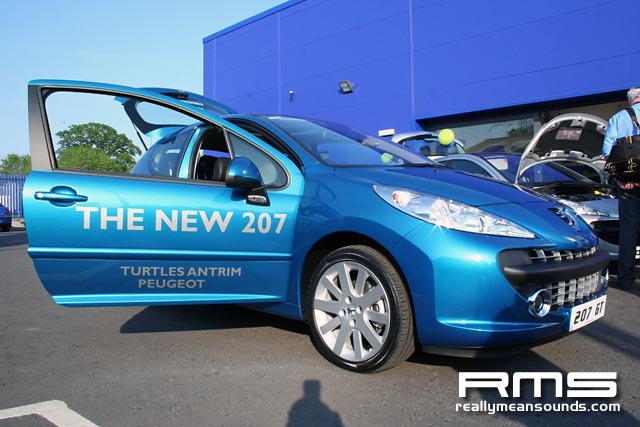 Turtles Peugeot, Antrim was one of many locations for the official launch of Peugeot’s new hatchback, the 207! 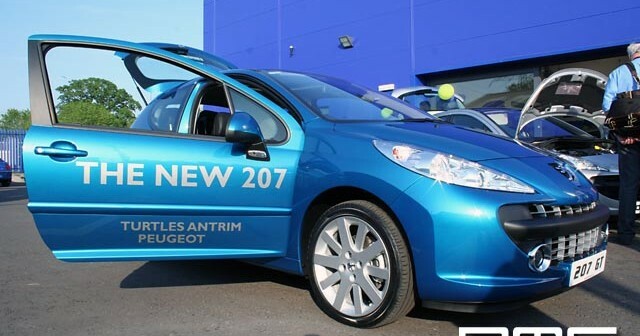 Labelled as "the drive of your life" the 207 represents Peugeot’s passion and desire; its spirit. Design and engineering live harmoniously to deliver the perfect driving experience. It’s designed to make every journey pleasurable. With it’s small body it looks sleek and with the GT model having a more ground drawing appearance with different bumpers your sure to turn heads nipping about in it’s varying range of engines. Inside this car there is a noticeable gain in space from the 206 which this model has now replaced. Available is a Cielo panoramic glass roof for those sunny days t bask in the sun with the air conditioning keeping those inside at a nice comfortable temperature for those long drives which this wee car will certainly do with great comfort and a rather nice driving position, especially with the adjustable height and distance steering wheel to suit those tall and small. As said before this is a nippy car with engines ranging from a 70bhp 1.4 Diesel right up to a rather punchy 1.6 16v Turbo putting out an incredible 150bhp which will be available later in 2006 and should be a hit with those who love a quick hot hatch with great handling, but the most impressive engine has to be the 1.6 Turbo with a combined fuel consumption of 40mpg which is excellent for the power your getting. With prices starting at 8,995 for a basic 3door model rising to 14,345 for the Turbo’d GT model with the GT 110bhp HDi 5 door going for 15,345 going by Peugeot UK’s price list. The cars can be got in a huge range of metallic colours and about 5 solid colours so a very wide range to choose from and at the launch tonight the sales team pictured along with other staff sold 3 within an hour so if that’s anything to go by they will certainly be a hit on the roads. Special Guest for the night was BBC Radio Ulster’s Hugo Duncan who kept the crowds entertained with his usual good charm and great banter along with his excellent singing.